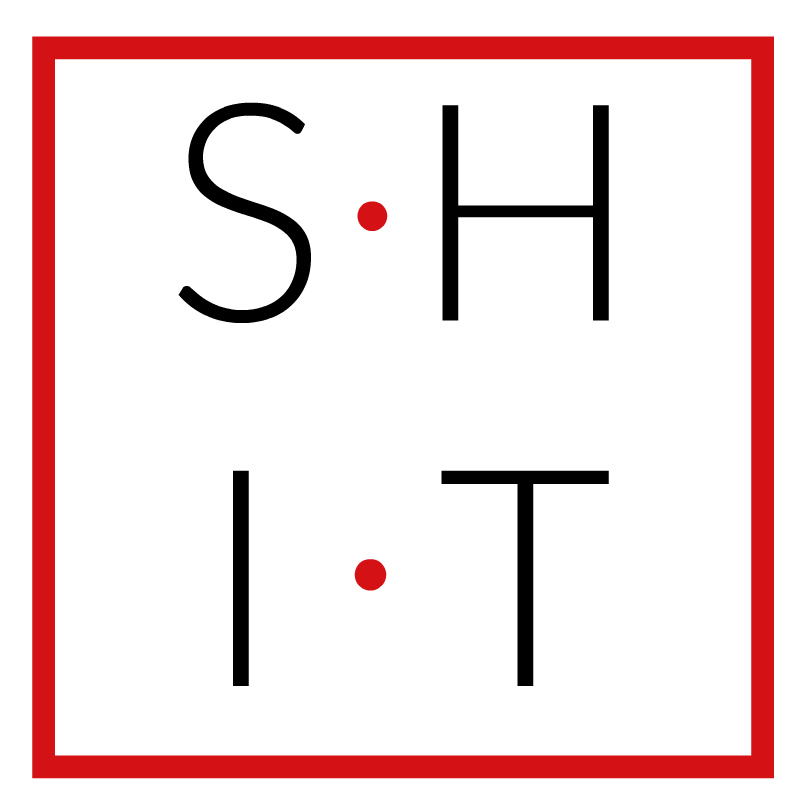 A little part of our childhood has gone - So Happy In Town | S.H.I.T. He was a hero. A legend. A teacher of morals. An entertainer. And a big part of our early lives. Yes, I am talking about Geoffrey from Rainbow, who sadly passed away this week at the age of 76. With his passing, he has taken a little piece of our childhoods with him because, let’s face it, if you were born in the 70’s and you didn’t watch Rainbow in those heady preschool days, you must have been living in a commune in the Outer Hebrides with no access to electricity and running water. Rainbow was at the centre of our carefree, itchy tank top wearing days. Geoffrey and his friends, Zippy, George and Bungle were our rockstars, all living together in their Rainbow House – not forgetting Rod, Jane and Freddy, who would pop by for a musical interlude every so often. So legendary were they all, that Zippy, George and Bungle each have their own Wikipedia page. And quite right too. Zippy was the cheeky one. The selfish one who struggled to share. The naughty one who would wind up docile George and sensible Bungle. The one who we all learnt how not to behave from. But really, a part of our pre-pubescent selves kind of wanted to be a bit more Zippy and much less Bungle, let’s be honest. You couldn’t fail to love George in all his pink, camp, snuggly loveliness. I just wanted to cuddle him, stroke his eyelashes and have him come and live at our house. Yes, I certainly found that last bit rather puzzling. But Bungle was a little on the dull side, I think we’d all agree. Unfortunately for him, he had that boring adult voice and the others clearly found him a pain in the ars. Perhaps Wikipedia have slightly over-analysed the dynamics of the Rainbow gang here, but a kinder, more patient man than Geoffrey there couldn’t be. He was always there, calmly sorting out the issues between his mouthy puppet friends. This model of self-control could have taught our parents a thing or two. The red mist never descended upon Geoffrey. Only very occasionally did he feel the need to zip Zippy’s larey mouth up when most adults would have flushed Zippy’s head down the loo after episode 2. And while mediating between his puppet co-stars, he taught us morals on how to be good and kind and to do the right thing. Then to top it all off, he would treat us to a story from the Rainbow Storybook. 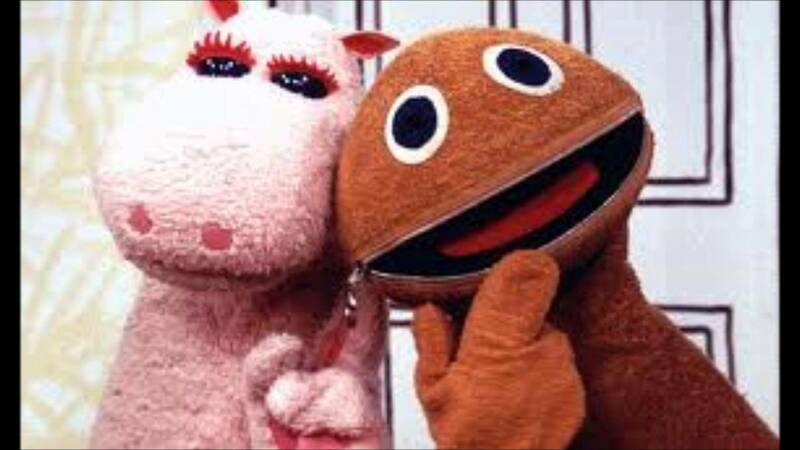 Once I had moved on to Blue Peter and Grange Hill I didn’t give Rainbow much thought, I’m ashamed to admit. I had no idea that it ran for more than 1000 episodes from 1974 – 1992. 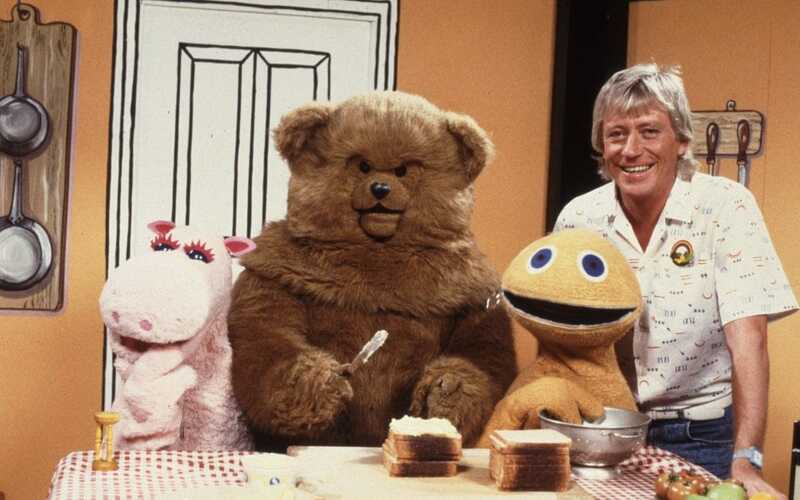 Sadly once this much loved kids’ programme came to an end, Geoffrey Hayes struggled to find work in television due to being typecast as Rainbow’s Geoffrey. He ended up stacking shelves in Sainsbury’s and drove a taxi for a while, with occasional TV appearances on the back of his Rainbow fame. But for all of us who grew up with him on our screens every day, his passing has taken a little piece of our childhood with him, but we’ll always have those fond memories of juice, biscuits, itchy tank tops and painting the whole world with a rainbow.